The Natural History Museum is one of London's premier tourist attractions, what a lot of people don't know is that the NHM is like the pumpkin from Cinderella. It doesn't turn into a carriage but as soon as the guests leave for the day, it undergoes a transformation into a magical party and event venue. At 6pm, the doors shut for guests and immediately re-open for the installation of whatever the event for that night. Within 1 hour the transformation is astounding. A well drilled team of 30/40 staff install tables, chairs, lighting, dance floors and event staging. This all unravels under the watchful eyes of the Blue Whale hanging from the ceiling. As Christmas approaches things get even busier and this changeover takes place every night and sometimes occurs in multiple areas of the same musuem. Of course it is not just the NHM where this occurs, any other museum in London worth it salt uses the downtime at the end of the day to bring in the event crews. It has become a vital source of income for venues all across the capital. 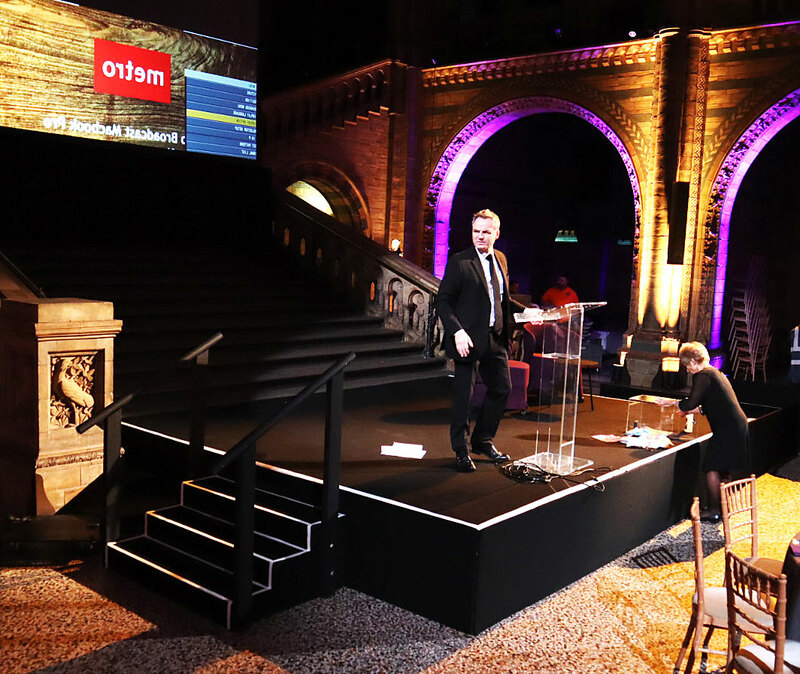 As certified suppliers to both the Natural History Museum and the Science Museum, Albert Hall Dance Floors are proud to have been working with both establishments since the late 1990s. We continue to this day to provide a selection of event hire equipment to party planner and event organisers. This includes dance floor hire for weddings, birthday parties and office Christmas events through to stages for bands, walkways for models, podiums for awards and even flambeaux for the entranceway. Our most recent installations at this venue have been complicated stage hires, that include access ramps for wheelchairs and stairs for people receiving awards. All of which are risk assessed and mean no difficulty for any of the event's guests accessing the stage. If you are looking to hire equipment for an event at any of the numerous museums throughout the London area then please give one of the team a call or use the contact form provided.